Christmas is TWO weeks from today! Can you believe it? December always goes soooo quickly…so much to do and just not enough time! From decorating your home to shopping for and wrapping presents, not to mention baking…you might have forgotten about planning your holiday table decor for that special Christmas meal. Not to worry…I have you covered! If you live in Toledo, you may have caught my TV “debut” on a local channel here. I was invited to appear on WTOL “Your Day at 9” (the CBS channel here in Toledo…channel 11). I was so excited for this opportunity, but also extremely nervous! 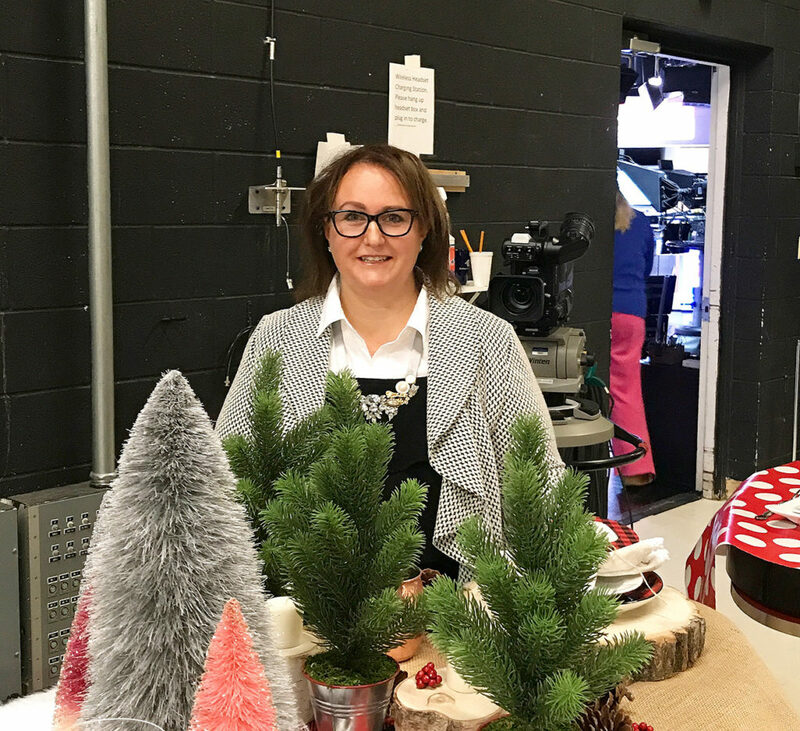 I was given 4-ish minutes to share some ideas for holiday tablescapes. When I was planning what I was going to share, that seemed like A LOT of time! Once you’re “on air and live,” it really isn’t. It went by so quickly that when it was over, I realized I had so much more to say about the tablescapes. And if you aren’t in Toledo, you probably didn’t get to see them at all…so I thought I’d share them in blog post form this week. Oh, that’s me right before I went on air! Do I look nervous? First up is my rustic tablescape! 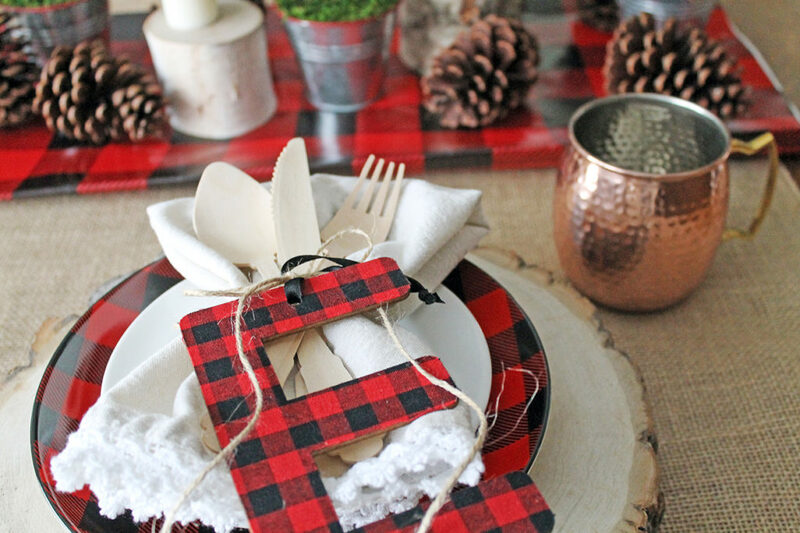 Think buffalo plaid (yep, you know how much I’m loving this trendy, yet classic, pattern this year), wood, pinecones, greens, burlap, and berries. Natural elements are definitely setting the tone for this rustic tablescape! I started with a burlap tablecloth. Here’s some advice…you don’t really need a “finished” tablecloth. I have been known to put a white tablecloth on my table (to protect it from heat and spills) and then cover it with burlap fabric. Just go to your local fabric store and have them measure and cut a piece of burlap big enough to cover your table. With basic burlap costing around $4.00 per yard, that is a lot more economical than purchasing a table covering. And for the buffalo plaid runner down the middle of the table? That’s just wrapping paper! Sure, you could probably buy a fabric one…and if you will use it year after year, then it’s worth it. For my needs, I went with the paper. The base is a thick wood charger plate (most craft stores have these in the floral area or the unfinished wood area of their store). I love the natural look of them…just like eating out in the woods! 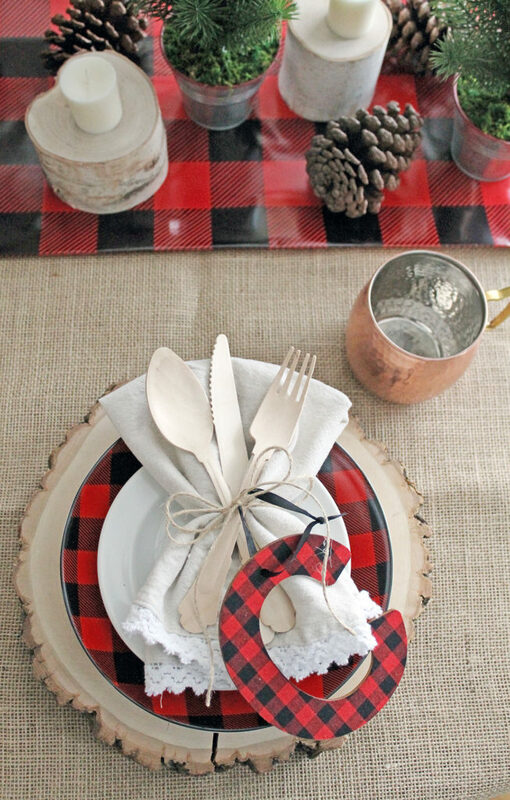 On top of the wood charger is a buffalo plaid dinner plate and a small white salad plate. I used light tan cotton napkins, trimmed with a bit of lace. I think that tiny bit of lace gives the look just a feminine touch. The napkin is tied together with some wood cutlery, using jute string. 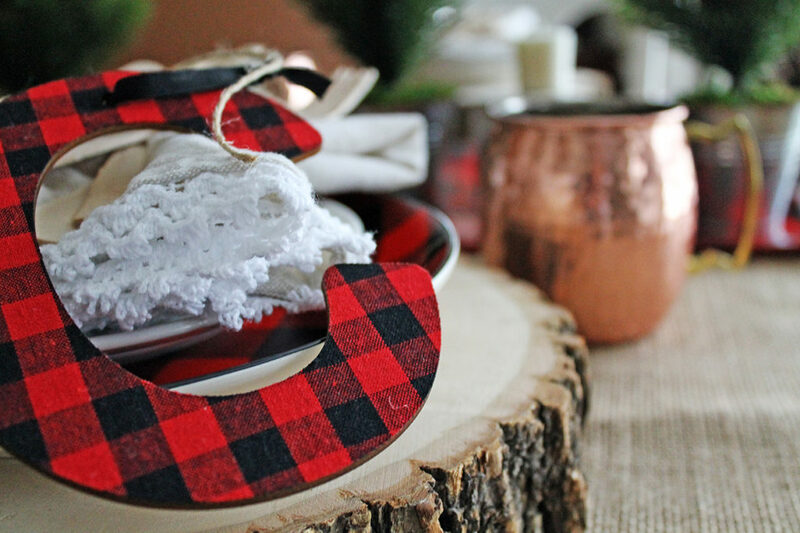 And the finishing touch is the buffalo plaid initial ornament! 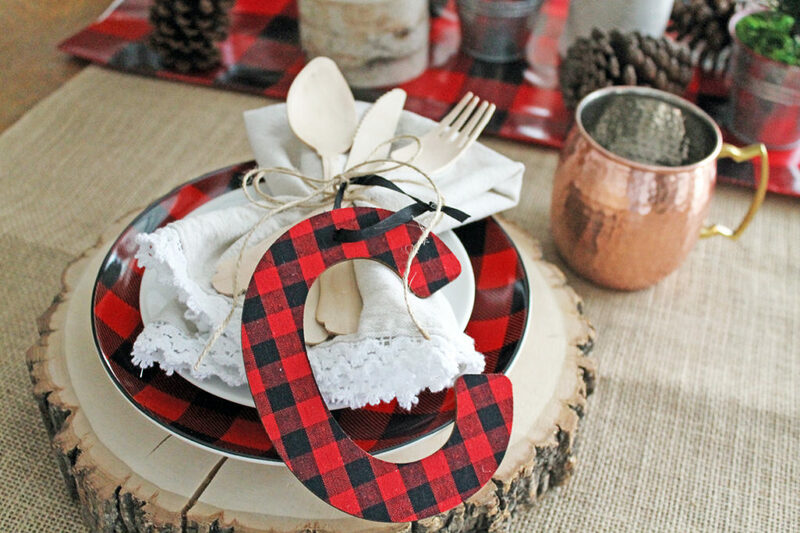 This serves two purposes…first, it acts as a place card telling guests where to sit AND it is a take-home favor. Everyone leaves with a new ornament to hang on their tree! And you can’t forget the glasses…or the mugs, in this case! 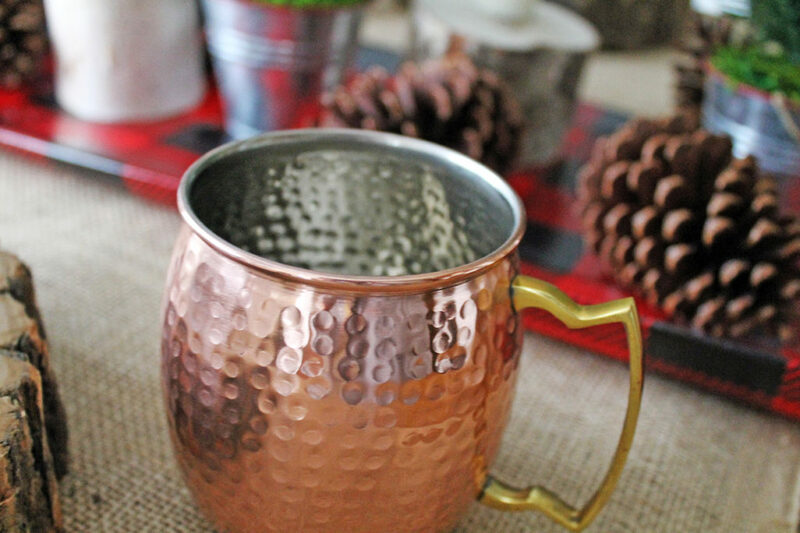 A hammered Moscow Mule copper mug is just perfect for this rustic, outdoor table! As I mentioned earlier, I cut and folded a long piece of buffalo plaid wrapping paper, and placed in down the middle of the table. 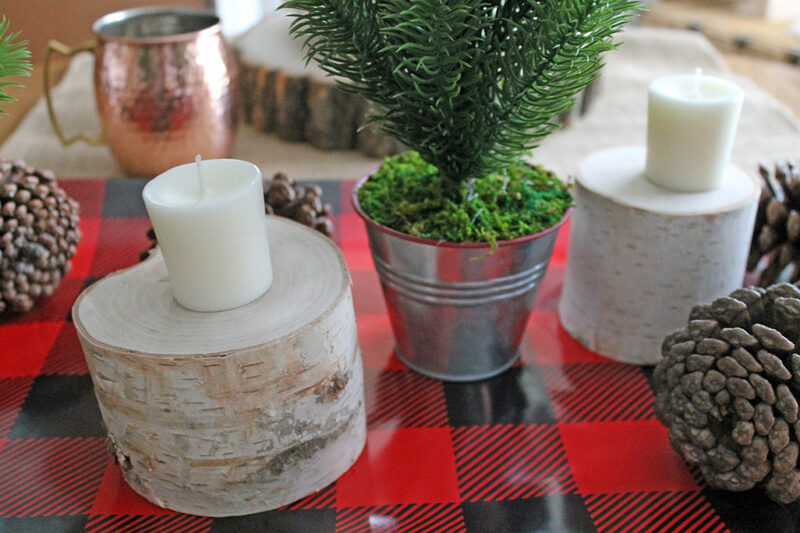 On top of that, I placed miniature evergreen trees inside tiny tin pails and small stumps of birch. 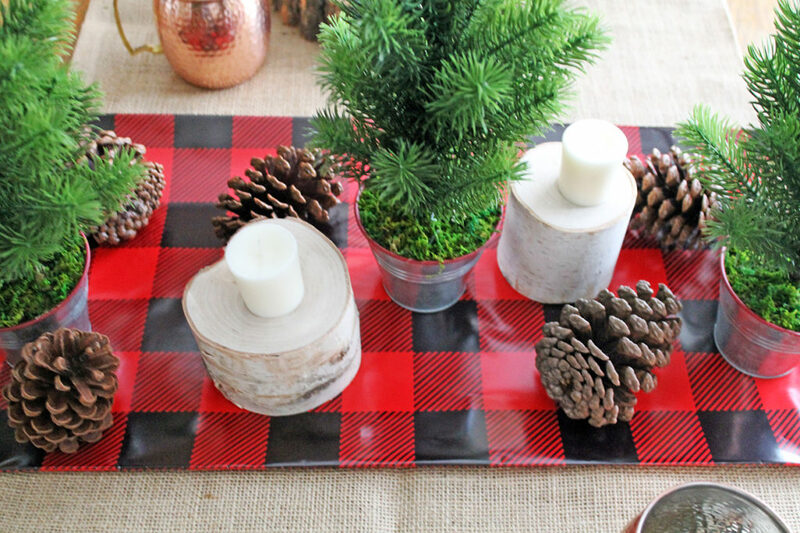 Scattered pinecones and candles complete the natural elements of the centerpiece. And if rustic isn’t your look, check tomorrow’s blog post. 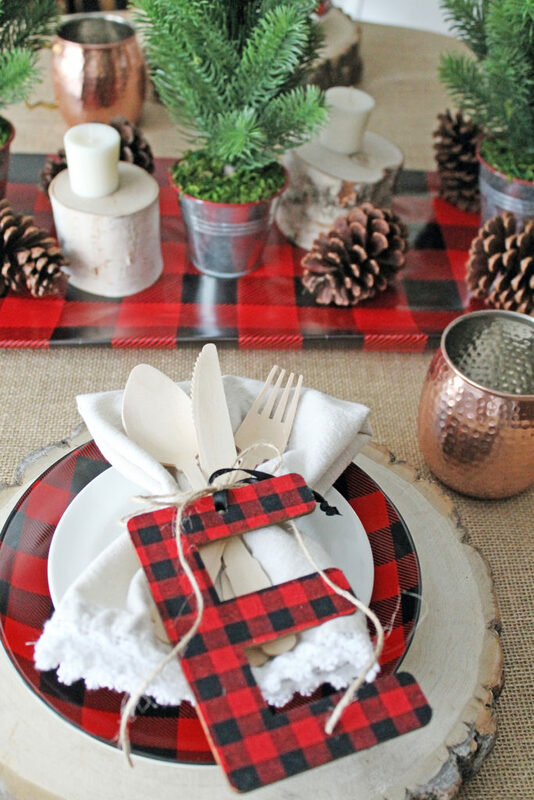 I’m sharing a glam look for a holiday tablescape!